The Isthmus of Panama (Spanish: Istmo de Panamá), also historically known as the Isthmus of Darien (Istmo de Darién), is the narrow strip of land that lies between the Caribbean Sea and the Pacific Ocean, linking North and South America. It contains the country of Panama and the Panama Canal. Like many isthmuses, it is a location of great strategic value. The isthmus formed around 2.8 million years ago, separating the Atlantic and Pacific Oceans and causing the creation of the Gulf Stream. This was first suggested in 1910 by North American paleontologist Henry Fairfield Osborn. He based the proposal on the fossil record of mammals in Central America. This conclusion provided a foundation for Alfred Wegener when he proposed the theory of continental drift in 1912. Vasco Núñez de Balboa heard of the South Sea from natives while sailing along the Caribbean coast. On 25 September 1513 he saw the Pacific. 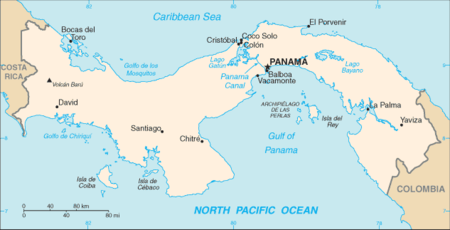 In 1519 the town of Panamá was founded near a small indigenous settlement on the Pacific coast. After the discovery of Peru, it developed into an important port of trade and became an administrative centre. In 1671 the Welsh pirate Henry Morgan crossed the Isthmus of Panamá from the Caribbean side and destroyed the city. The town was relocated some kilometers to the west at a small peninsula. The ruins of the old town, Panamá Viejo, are preserved and were declared a UNESCO World Heritage Site in 1997. Silver and gold from the viceroyalty of Peru were transported overland across the isthmus by Spanish Silver Train to Porto Bello, where Spanish treasure fleets shipped them to Seville and Cádiz from 1707. Lionel Wafer spent four years between 1680 and 1684 among the Cuna Indians. Scotland tried to establish a settlement in 1698 through the Darien scheme. The California Gold Rush, starting in 1849, brought a large increase in the transportation of people from the Atlantic to the Pacific. Steamships brought gold diggers from eastern US ports, who trekked across the isthmus by foot, horse, and later rail. On the Pacific side, they boarded Pacific Mail Steamship Company vessels headed for San Francisco. Ferdinand de Lesseps, the man behind the Suez Canal, started a Panama Canal Company in 1880 that went bankrupt in 1889 in the Panama scandals. In 1902–4, the United States forced Colombia to grant independence to the Department of the Isthmus, bought the remaining assets of the Panama Canal Company, and finished the canal in 1914. The closure of the Isthmus led to allopatric speciation events of marine organisms isolated on each side (blue and green). 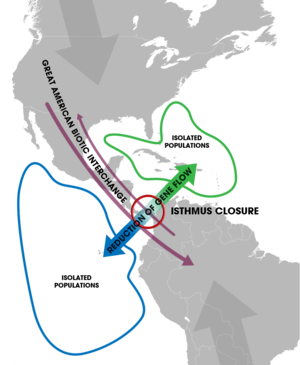 Terrestrial species also migrated between the two continents (the Great American Biotic Interchange) upon the formation of a passable land bridge. A significant body of water (referred to as the Central American Seaway) once separated the continents of North and South America, allowing the waters of the Pacific and Atlantic Oceans to mix freely. Beneath the surface, two plates of the Earth's crust were slowly colliding, forcing the Cocos Plate to slide under the Caribbean Plate. The pressure and heat caused by this collision led to the formation of underwater volcanoes, some of which grew large enough to form islands. Meanwhile, movement of the two tectonic plates was also pushing up the sea floor, eventually forcing some areas above sea level. Over time, massive amounts of sediment from North and South America filled the gaps between the newly forming islands. Over millions of years, the sediment deposits added to the islands until the gap was completely filled. By no later than 4.5 million years ago, an isthmus had formed between North and South America. However, an article in Science Magazine stated that zircon crystals in middle Miocene bedrock from northern Colombia indicated that by 10 million years ago, it is likely that instead of islands, a full isthmus between the North and South American continents had already likely formed where the Central American Seaway had been previously. Evidence also suggests that the creation of this land mass and the subsequent warm, wet weather over northern Europe resulted in the formation of a large Arctic ice cap and contributed to the current ice age. That warm currents can lead to glacier formation may seem counterintuitive, but heated air flowing over the warm Gulf Stream can hold more moisture. The result is increased precipitation that contributes to snow pack. The formation of the Isthmus of Panama also played a major role in biodiversity on the planet. The bridge made it easier for animals and plants to migrate between the two continents. This event is known in paleontology as the Great American Interchange. For instance, in North America, the opossum, armadillo, and porcupine all trace back to ancestors that came across the land bridge from South America. Likewise, bears, cats, dogs, horses, llamas, and raccoons all made the trek south across the isthmus. As the connecting bridge between two vast land masses, the Panamanian biosphere is filled with overlapping fauna and flora from both North and South America. There are, for example, over 978 species of birds in the isthmus area. The tropical climate also encourages a myriad of large and brightly colored species, insects, amphibians, birds, fish, and reptiles. Divided along its length by a mountain range, the isthmus's weather is generally wet on the Atlantic (Caribbean) side but has a clearer division into wet and dry seasons on the Pacific side. Angehr, G. R.; Dean, R. (2010). The birds of Panama: a field guide. Zona Tropical Publication. Comstock Publishing Associates, Cornell University Press. ISBN 978-0801476747. Mellander, G. A. (1971). The United States in Panamanian politics: the intriguing formative years. Daville, Ill: Interstate Printers & Publishers. OCLC 138568. Mellander, G. A.; Mellander, N. M. (1999). Charles Edward Magoon: The Panama Years. Río Piedras, Puerto Rico: Editorial Plaza Mayor. ISBN 1-56328-155-4. OCLC 42970390. Montes, C.; Cardona, A.; Jaramillo, C.; Pardo, A.; Silva, J. C.; Valencia, V. (2015). "Middle Miocene closure of the Central American Seaway" (PDF). Science. 348 (6231): 226–229. doi:10.1126/science.aaa2815. Retrieved 25 March 2018. Lay summary (25 March 2018). O’Dea, A.; Lessios, H. A.; Coates, A. G.; Eytan, R. I.; Restrepo-Moreno, S. A.; Cione, A. L. (2016). "Formation of the Isthmus of Panama" (PDF). Science Advances. 2 (8): e1600883. doi:10.1126/sciadv.1600883. PMC 4988774. Retrieved 25 March 2018. Osborn, H. F. (1910). The age of mammals. Macmillan. Retrieved 25 March 2018. Wikimedia Commons has media related to Isthmus of Panama.